The Drive in/Drive-Thru pallet racking system is the most cost effective, high density storage system. For many warehouses storing perishable goods, the Drive-In/Drive-Thru system is often the preferred choice. 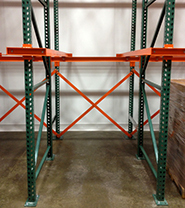 Drive-In/Drive Thru Pallet Racking comes in Roll-Formed or Structural styles. 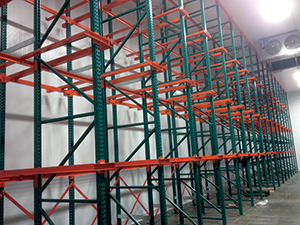 The advantages: of the Drive-In/Drive Thru pallet racking system is that it requires fewer aisles allowing you to acquire better cube space utilization than selective pallet racking. The Drive-In/Drive-Thru Pallet racking system allows you to store up to 80% more pallets than selective pallet racking. The Disadvantages: because forklifts have to drive in side the racking system the Drive-In/Drive-Thru pallet racking system is subject to more abuse than any other rack structure. Shelf Master offers a wide variety of safety options to help endure the life of your Drive-In/Drive-Thru Racking system by providing you with protective guards, offset front legs, heavy horizontals, reinforcement posts, free standing column protectors, and more. Fore more information visit our Pallet Rack Accessories page.